Double door cabinet with two keys. Medium Narcotics Cabinet w/single door, double lock. 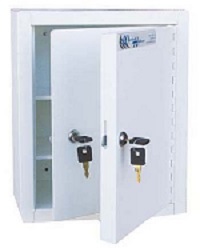 Keyless Narcotics Cabinet, medium, single door with 2 plexiglass windows. 2729 Keyless Narcotics Cabinet features a single door with 2 plexiglass windows for easy viewing of contents. The convenient and highly reliable mechanical combination push button lock can be reset. The self-locking spring action latch on the cabinet assures secure closure. 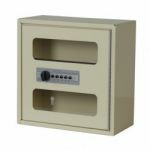 This Narcotics Cabinet is wall mountable with keyholes for added convenience.